Knitwear is a cool-weather thang. It just is, by nature, by assumption. It's now August, and I know the last thing on most people's minds is Christmas, Hanukkah, or anything 'holiday'. Well, for most knitters, preparation for The Season started months ago. Ramping up on general shop listings, creating seasonal items, and moving back over to heavier knits and warm cuddly things. Yes. Knitting in August. Yes. Knitting when it's 105F outside. It really is a special kind of madness. My family celebrates Chrismukkah (my mom's Jewish, my dad is secular Protestant), and I planned on creating stockings for a few couples. I started about a month and a half ago on this stocking, and finally sat down and knit it out today. It only took me about two hours, so I have no idea why I've put it off for so long. But there you have it. As you can see, I changed tension after the cuff. I'm going to try fulling it a bit before I work on the embroidery (holly leaves and berries), but will have to rip it out, if it doesn't tighten up any more. I love it and plan on starting the second in a few hours. A special kind of madness. I've reached an all-time high number of listings in my shop, so I've decided to slow down a bit on my tabi production. I really want to beef up the number of traditional-toed socks before cool weather sets in, since they did so well last year, despite the limited colors available, and I was pretty stressed in getting them made. I placed my order for the new yarn last week, so I've got awhile before I'm able to dig in on that. While I wait, I've decided to work on some of my personal projects. Things are pretty slow in etsy-land, so I figured it'd be a good thing to take advantage of. I really want to crank out at least two sweaters before it gets cool, and have about six Chrismukkah stockings that I'd like to finish. Knitting really causes a special kind of seasonal madness. In June, the pressure starts to get warm woolies ready for The Season, so orders of wool, alpaca, etc. start arriving. 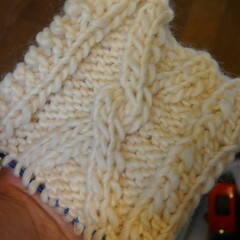 Thick sweaters, thrummed mittens, and warm slippers start production in the heat of the summer. If you're not planning or already working by July, a little bit of a panic starts setting in. By the end of August, you'd better have a nice bit of product stocked up, or the pinch is really on. And I'm a willing participant. Below is the first repeat of the cabled cuff for a lovely, classic stocking. I plan on making six of these, and I'm getting a head start! A new week, another Dirty Little Secret! In January, I started matching colors, trying to find a color combination that made me sigh, and I found it. 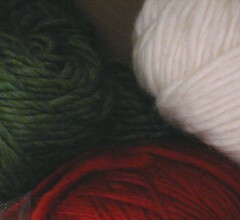 The yarns arrived at the end of February, and can you guess the season they're for? Pretty obvious, isn't it? I've been thinking about Christmas for three months -- ya know, the time when most people are paying bills and trying to forget about the holidays? That's me, always planning ahead. The project is actually a personal project. 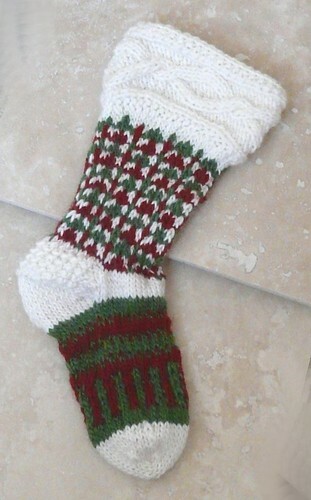 I'm planning on making Chrismukkah stockings for my brother and his partner and my mom and stepdad, this year. If I have time, I'll squeeze in two more for my dad and stepmom. Got a dirty little secret you'd like to share? Tell me about it here -- I'd love to feature other crafters and artists!